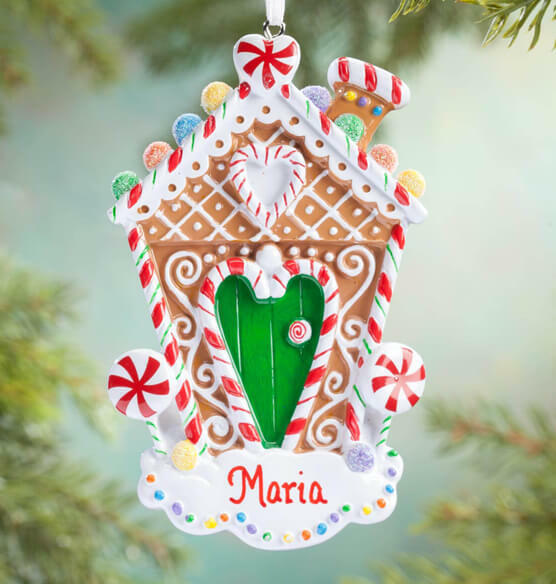 Our gingerbread house is a sugar-topped gumdrop, lollipop dream ... creating sweet Christmas magic when personalized! Adorably detailed and sparkling with glitter, it's fairy-tale fun for kids of all ages, and a keepsake treat when we add one special name. Specify name; limit 1 line, 8 letters/spaces. Resin. 4 1/2" long x 3" high. It was much nicer than I thought. I bought thi8s to hang on our tree for our granddaughter and very pretty. I bought this for my daughter in her first place on her own.